Interesting Plot, Interesting Characters. Big Robots (Duh). I'll say this straight off the bat, it is not the best anime the Gundam series has to offer. But opinions differ, people think 00 is worse than Wing and vise versa. I mean there's people who dislike both anime but I'm not talking about them, I'm talking about Seed. 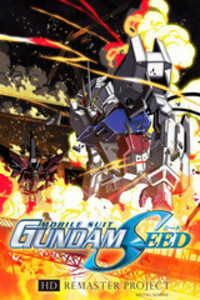 Seed is really good, character development plays a big role in this one. You get your usual princess/savior/antagonist situation but the time the creators invested into developing the characters really makes the dynamic shine through, especially when every other character gets involved. My one complaint about the series is that it's probably dragging a bit longer than it should, it's likely it may put you off the series as well. However, the outcomes and twists in the story make it worth sticking around until the end. Overall, if you're a Gundam fan, you're likely to appreciate this a bit more than standard. If you're a mecha fan, you'll definitely enjoy this.